Two recipes I tried over the weekend and found right. Although I made no alterations of my own, I am jotting them down for future reference, in case the original pages became inaccessible for these recipes. Original recipe also had following two ingredients, which I skipped. It probably is supposed to make a difference, but I wanted to keep my sauce usable in various recipes. I thought salt and vanilla may interfere. Melt butter in a saucepan over low-to-medium heat. Proceed to the next step just before it completely melt or immediately after it. Add all the brown sugar and stir until sugar is uniformly wet. Add all the cream, lower the flames a bit and whist the mixture until cream is mixed well. Turn the heat back to medium and let it boil for 10 minutes. Keep stirring or whisking once in a while. If you are using vanilla and salt, add it a little at a time to taste and mix well. Chill in a tight-lid container for later use. I used butterscotch sauce as sweetener in my usual ice cream recipe to get nice home-made butterscotch ice-cream. Mix all the ingredients well. Using a blender is recommended for smooth batter. Blend until mixture is smooth and bubbles form on top. (I recently acquired a hand-blender and it was super-convenient for this. Otherwise pour in your usual mixer-grinder or food-processor to make the batter). Let batter sit at room temperature for 15 minutes. It can also be refrigerated for up to one day. 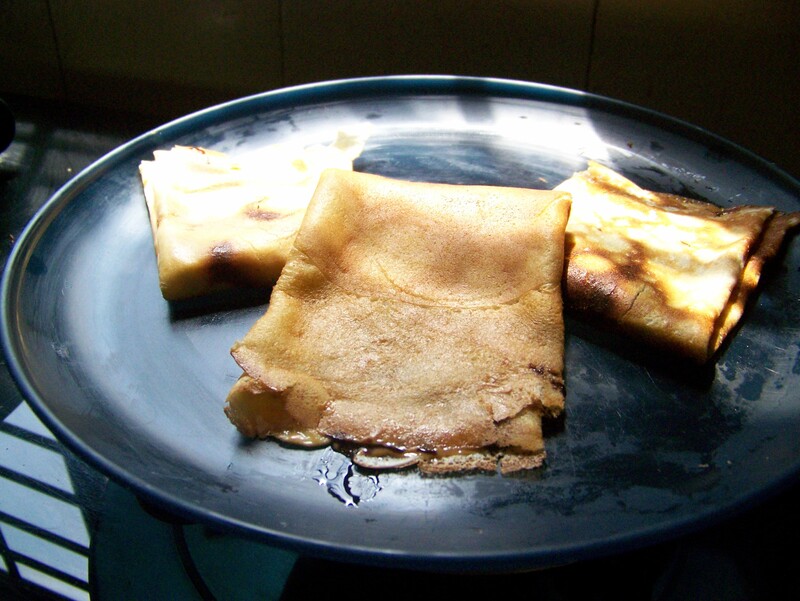 Heat a flat-bottomed pan (flat dosa-tawa will do very well) and coat with butter. Pour 1/3 cup of batter at a time and swirl to cover the bottom of the pan. Lossen the edge with the spatula and then flip. Cook the other side for one minute. Slide it off the pan or pick up with the help of spatula. Note: The original recipe I had used did not use baking powder and cream. 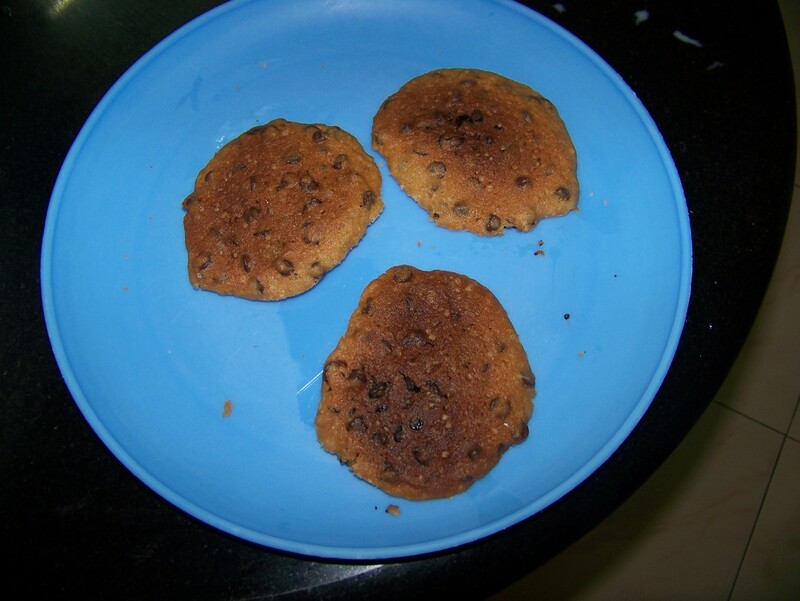 But Abhaya found the resulting cookies to be too hard for his taste. So, I used these to make them softer and more cakey. Leave the butter outside the fridge so that it softens. Alternatively use microwave to warm and soften it. In a mixing bowl beat butter, fine/castor sugar, brown sugar and vanilla essence until mixed well. Beat egg in a bowl and mix it in the mixture prepared above. Add cream, but not too much. Make sure that the mixture doesn’t become too watery. Add only the heavy cream. Drain out any water from it before adding. Sift maida and baking powder and add into the mixture (I use a bowl big enough so that maida can be sieved directly into the mixture). Mix the entire thing. Add chocolate chips to the mixture and mix to spread the chips evenly. Make small balls of the mixture and put on the baking mat. (I used silica mat and don’t need to grease it. Other baking mats might need greasing). You should press the balls a little. But the circle will spread while baking. So, don’t press to the final size you expect, but a little less. Also leave enough space between the balls. Preheat the oven and bake. I baked at 150 degrees in Microwave oven. Baking for 6 minutes worked best. It may take more time in normal oven (I read 16-18 minutes). Do not wait for the cookies to harden in the oven. Take out when they have browned a bit. The cookies in the photo here are actually overbaked. This is a variation of Watermelon Ice cream I made and posted about earlier. The recipe produced 2 small scoops of ice cream for four people. Increase in proportion depending on your requirement. This is not a custard based recipe. 3 tsp sugar (powdered preferred). If you are an instant coffee person, 1 tsp of coffee powder can be used. Taste the mixture and adjust. Take it out, cut in small pieces, put the pieces in a blender and run on the lowest setting (It helps to put pieces in small batches of 2-4). Pour back in the bowl and freeze again until set. You can experiment by adding chocolate chips, almonds or caramel (add after step 3). I had put chocolate chips, which I really liked. But Abhaya would have preferred it without chocolates. Note: This is NOT a custard based recipe. 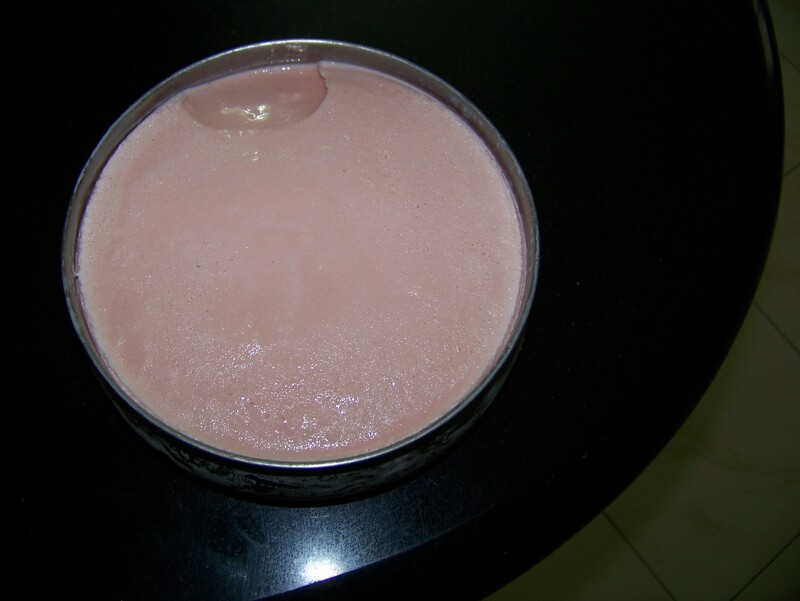 Mix cream, milk powder, vanilla extract, watermelon juice and condensed milk in a bowl that can be covered and used for freezing. Mixing cream may be difficult. I took small portions of cream and the liquid in a cup and whisked it. Even if the cream is not thoroughly mixed, it is all right. Taste the mixture and mix sugar to taste only if needed (I did not have to add any further sugar. The sugar in milk powder, condensed milk and watermelon was enough). You can try varying the proportion of cream and milk powder or add milk to your taste. If you have an ice cream maker, it may help produce a better texture instead of the blender. Never thought this day will come. 😀 But here I am – sharing a recipe. It is not large-scale recipe. I had started off by quick 5-minute recipe for cake in a cup and then improvised for better results. Increase the ingredients in proportion if you want to cook more. 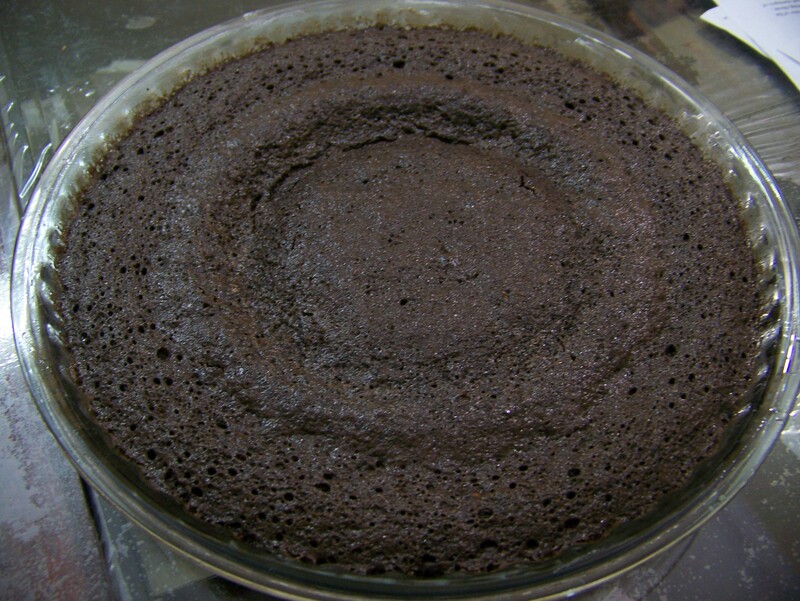 Sift Maida, corn flour, baking powder, cocoa powder and keep separately (Sifting is essential to make the cake lighter. Else it will turn out dense). Break the eggs and separate the yolk and egg white in two separate small bowls. Beat egg yolk and pour the milk in it. In a pan (not baking pan, but something big enough to hold all the batter), mix sugar and oil and whisk it until it is light and fluffy. Add cream, condensed milk, vanilla essence and beaten egg white to sugar and oil mix and whisk until it has mixed well. Add the flour mix and milk+egg yolk alternately to the above mixture and whisk each time till ingredients have mixed well. Do not over-whisk. Apparently over-whisking causes the cake to get dense. Whisk only till it has mixed well. At this stage you can taste the batter to ensure that sugar etc. is to your taste. Grease the baking pan with oil (you can also sprinkle some flour on top of it) and pour the batter in it. Optionally sprinkle the chocolate chips on the batter at this stage. (It melts creating chocolaty pockets in the cake). Today I started writing more on that story. Right now I am exploring Smriti’s mother. What made her the way she was. It won’t be long. But will give some idea. Also, right now I am writing it independently. I do not know where this would fit in the main story. I will work all that out later. Sorry about delay in posting the next parts of the story. These parts needed more rewriting. But I am shortly updating the next part here.